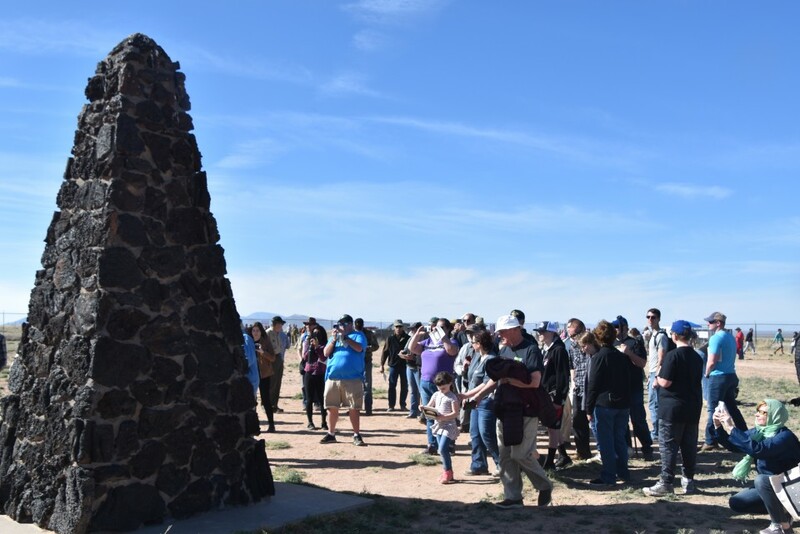 Many enthusiastically pointed at and took selfies with signs warning of radioactive leftovers at the Trinity Site on April 6, one of the two days each year that the designated historic monument in a present-day military facility in southern New Mexico is open to the public. But at the entrance, in stark contrast, a dozen people greet tourists with homemade signs bearing a message that shatters the jovial, sightseeing mood: "We are the forgotten for 74 years. We are the victims of the first atomic bomb." As visitors drive in and out of the White Sands Missile Range, members of the group hand out pamphlets about their cause to the curious, explaining how they believe their families have for generations suffered from radiation poisoning-linked cancer after being exposed to nuclear fallout which settled in the surrounding basin after the July 16, 1945 test. 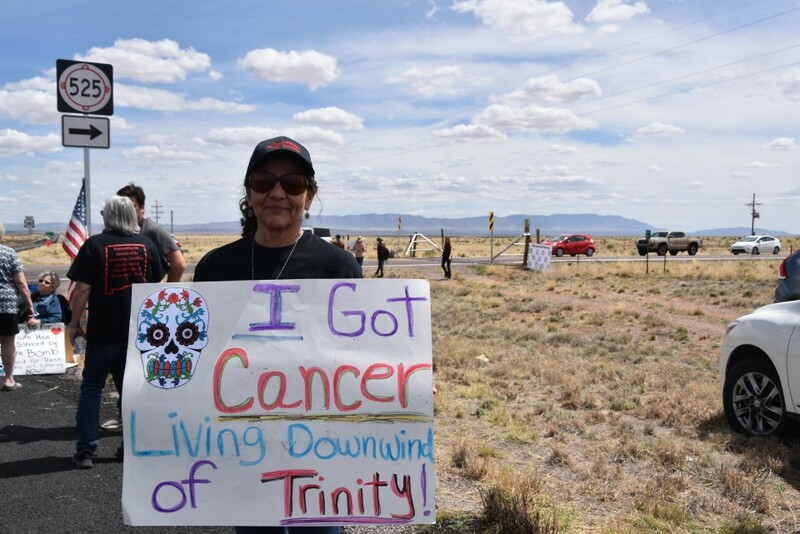 "We have been left out here and ignored by our own government," said Tina Cordova, a 59-year-old thyroid cancer survivor and sixth-generation New Mexican whose father was four years old at the time of the nuclear test. "It's a never-ending cycle. Someone gets diagnosed (with cancer) and they die." The organization that Cordova co-founded in 2005, the Tularosa Basin Downwind Consortium, has identified more than 1,000 people -- those alive at the time of the explosion and their descendants -- who have been diagnosed with cancer, which they attribute to the 1945 test. For years, Cordova has been at the forefront of the fight for victims to be recognized by the U.S. government in the Radiation Exposure Compensation Act, a nearly 30-year-old Department of Justice program that "presents an apology and monetary compensation to individuals who contracted certain cancers and other serious diseases" from exposure to radioactive materials. The act, which took effect in 1990 and was last significantly revised in 2000, allows select groups of people to apply for compensation for medical expenses. As of April 7, RECA had compensated more than 4,000 claimants -- miners and mill workers who transported uranium -- in New Mexico with nearly $383 million, according to the DOJ. But Cordova and residents from the Tularosa Basin region that surrounds the missile range are pushing for the federal government to recognize their community as "downwinders." Currently, only those who lived in affected areas near the Nevada Test Site, including "downwind" states Arizona and Utah, during World War II and Cold War-era testing and who have developed "eligible cancers" from a list are qualified for RECA compensation. Claimants in Arizona have received more than $612 million through RECA, while those in Utah have been paid $381 million in total. "It's environmental racism," Cordova said about the government's lack of radioactivity studies into the area over the years. In the 1940s, many of the Tularosa Basin's residents were Native American and Hispanic, she added. Though bills that would amend the program to extend protections to residents living near the Trinity Site have been introduced to U.S. Congress over the last eight years, none have gained traction, said Cordova. "We are expendable," said Frank Gallegos, 70, whose parents and siblings experienced the blast from their ranch located 20 kilometers from the test site. "Most of my family is gone." Gallegos said that because of a lack of warning from the government about the nuclear test or its effects, his family consumed water, milk, and meat contaminated by radioactive fallout that came from ash that rained down on the surrounding community for days after the blast. Humans can suffer the effects of exposure to radioactive material through skin contact with fallout, breathing air that contains radioactive particles or drinking milk from cows who grazed on fields where fallout landed, according to the Centers for Disease Control. A CDC report found that those involved in the project were provided gear and instructions to protect them from the fallout, a privilege not extended to nearby residents. 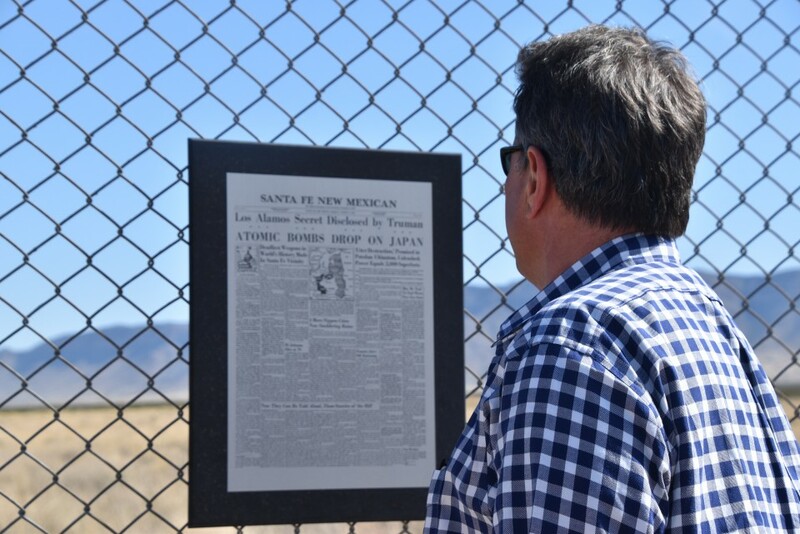 Though the test site was chosen for its remote location and accessibility from the Los Alamos laboratory 320 km to the north, where the atomic bomb was designed as part of the Manhattan Project, families who had owned land for generations, such as the Gallegos family, reportedly resided on ranches as close as 20 km to ground zero. In the decades since the end of nuclear weapons testing in 1962, the U.S. has ordered government agencies to study the impact of radiation exposure among populations living near Manhattan Project facilities, such as the Nevada Test Site and Hanford Nuclear Reservation in Washington state. The National Cancer Institute began a study to investigate the effects of radiation on the Tularosa Basin population in 2014. The analysis, which will reportedly be released this year, must undergo a peer review before being published in a scientific journal, according to a spokesman from the institute. Cancer caused by radiation poisoning is well documented by U.S.-backed studies in Japan, where numerous atomic bomb survivors died in the years following the bombings of Hiroshima and Nagasaki. Cordova noted that the plutonium-loaded bomb codenamed "Fat Man" used over Nagasaki on Aug. 9, 1945, was of the same design as the Trinity bomb, which unlike the former was detonated close to the ground. The blast's proximity to the ground caused the resulting fallout to scatter widely across the basin and into surrounding communities. U.S. Senators Tom Udall and Martin Heinrich of New Mexico this month reintroduced a bill to amend the Radiation Exposure Compensation Act to also cover victims in New Mexico among others such as Cold War-era uranium workers and residents of Guam.